The endangered mammals may be facing a food shortage in the Gulf of Maine, causing them to migrate to less-protected areas. The North Atlantic right whale, the world’s second-most endangered marine mammal, is having a catastrophic year in the waters off New England and Atlantic Canada, and scientists from Maine to Newfoundland are scrambling to figure out why. At least a dozen right whales have been found dead this summer in the worst die-off researchers have ever recorded, a disastrous development for a species with a worldwide population of about 500. 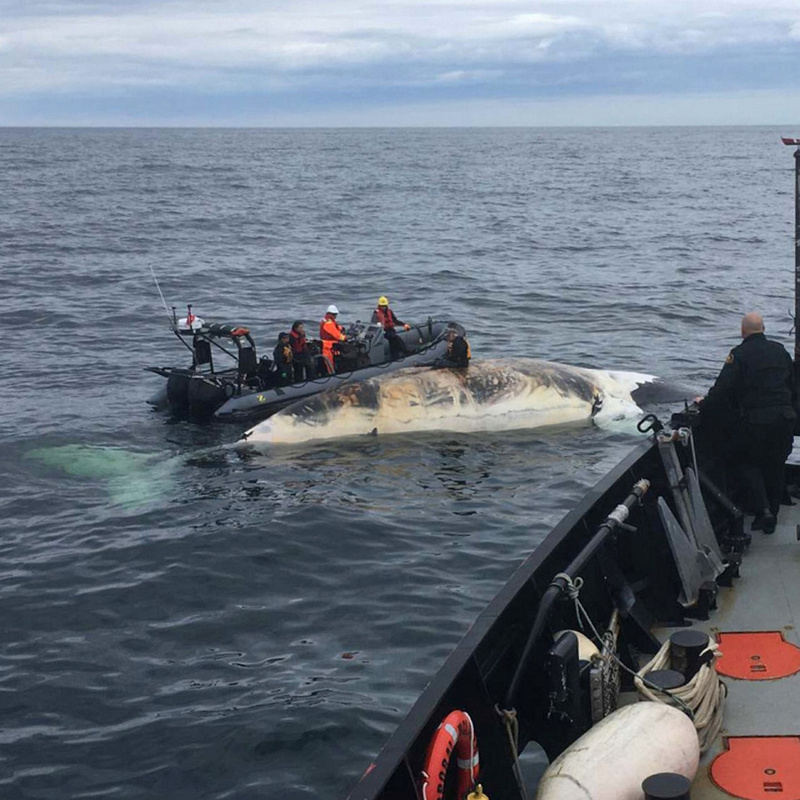 The Canadian Department of Fisheries and Oceans and partners collect tissue of dead North Atlantic right whales in the Gulf of St. Lawrence. Endangered North Atlantic right whales have had the worst year on record, with more than 3% of the entire population found dead this summer. 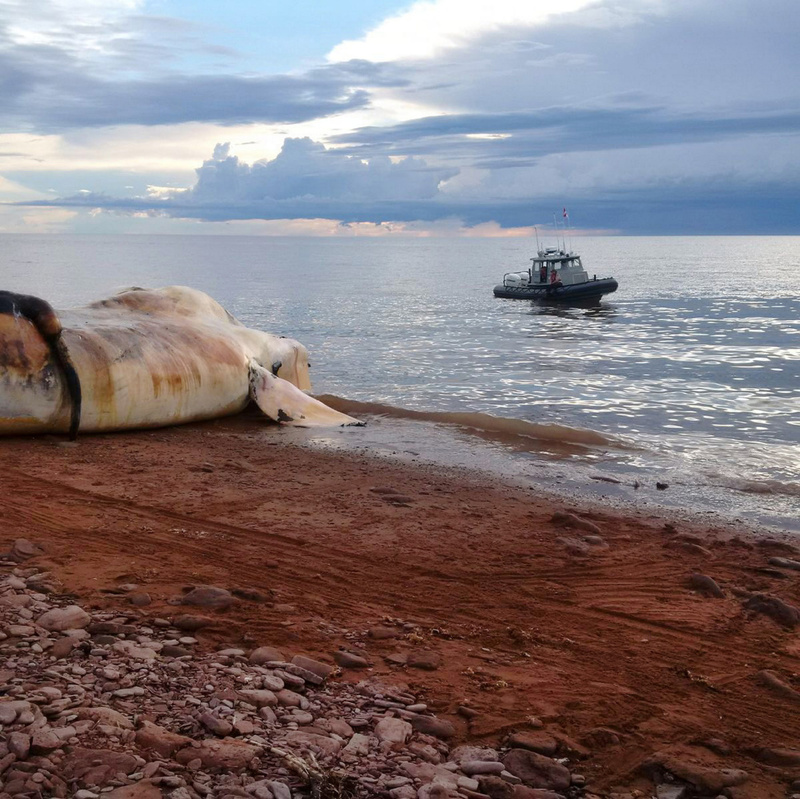 Canadian authorities have documented 12 dead whales in the Gulf of St. Lawrence since June 7, though it’s possible that two carcasses that weren’t recovered after their initial sightings were counted twice. Two more of the rare, slow-moving whales were found dead off Barnstable and on Martha’s Vineyard, Massachusetts, bringing this summer’s mortality to between 12 and 14 whales, nearly 3 percent of their total population. 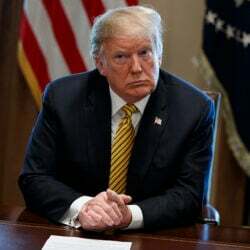 Humans appear to have been the immediate cause of at least some of the deaths. Conclusive necropsy results have been issued for just four of the whales found off Canada, showing one had become entangled in snow crab fishing gear and three were apparently struck by ships. The whale deaths have prompted Canadian officials to impose emergency restrictions on shipping and snow crab fishermen in parts of the Gulf of St. Lawrence – the vast body of water bounded by New Brunswick, Nova Scotia, Newfoundland, Labrador and eastern Quebec – and spurred an urgent effort by researchers to figure out what happened. The whales, Hardy says, have been increasing in numbers since 2014. The urgent question for researchers is why. FOOD SHORTAGE IN GULF OF MAINE? One possibility is that many right whales have come to the area because they have been unable to find sufficient food in the Gulf of Maine and Bay of Fundy, where their numbers have dwindled during the summer feeding season. The whales – which can live to be 75 years old – forage on clouds of their favored prey, the copepod Calanus finmarchicus, a tiny flealike creature they can scoop up by the millions with their sievelike baleen. This is what traditionally brought them to the waters off Lubec, Maine, and Grand Manan Island, New Brunswick, this time of year. There are only about 500 right whales left in the world, scientists say. But the Gulf of Maine is warming faster than any other part of the world ocean, save a stretch of ocean current off northern Japan, raising concerns among marine scientists that Calanus – which also feeds herring and other forage fish at the bottom of the food chain – might have a harder time living here. Catherine Johnson, who studies the tiny creatures at Bedford Institute for Oceanography outside Halifax, says their numbers have been declining on the Canadian side of the Gulf of Maine and off the southern coast of Nova Scotia, where currents carry the cold-water creatures into the gulf. Fortunately, even in record warm-temperature years like 2012, Calanus remained abundant in much of the Gulf of Maine, but the timing of their growth and movements – both tied closely to the temperature of the water they live in – may be falling out of sync with the whales’ own movements. Record suspects the whales have been moving north in search of food. “I can’t tell you that ‘yes, they have moved because of their food,’ but I think that’s probably the reason and we are looking at the data to see if it demonstrates that,” he says. Whatever the reason, summertime right whale numbers in the Gulf of Maine have generally been down, a development that prompted researchers in 2015 to try to figure out where they were going instead. They also were trying to solve a longstanding mystery: Where were the dozens of right whales that returned to Cape Cod in late winter but didn’t show up at known summer feeding grounds going to eat. The effort was complicated by the whales’ unpredictable movements – they travel long distances, are few in number and are often hidden underwater. They also have an expansive range: from as far as the south coast of Florida (where most calves are born) to Maine and the coasts of the Canadian Maritimes (for summer feeding) and occasionally as far as northern Europe. But knowing what they did about where the whales fed, a group of researchers from the Canadian Whale Institute on Campobello, the New England Aquarium, Dalhousie University in Halifax and the National Marine Fisheries Service predicted they might be found in a stretch of the southern Gulf of St. Lawrence. 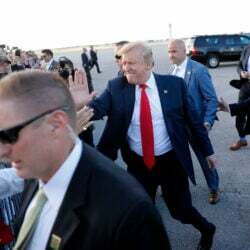 The National Marine Fisheries Service, part of the National Oceanic and Atmospheric Administration, sent an aircraft to Prince Edward Island to survey the area and discovered dozens. What they don’t know is if the whales have recently come here for lack of food elsewhere, or if this is a longstanding feeding ground for the species. “We have found a new critical habitat, but we just don’t know if it’s new to us, or new to the whales,” Brown says. A ballet of three North Atlantic right whale tails break the ocean surface off Provincetown, Mass., in Cape Cod Bay in April 2008. Marine conservation groups say the endangered North Atlantic right whale is having such a bad year for accidental deaths in 2017 that all the mortality could challenge the species’ ability to recover in the future. There are thought to be no more than 500 of the giant animals left. Unlike in the Bay of Fundy and Gulf of Maine – where the right whales were expected – there were few restrictions in place to keep ships and whales away from one another, or to reduce the chance the marine mammals would get caught up in snow crab gear, which is similar to the gear used by lobstermen in Maine. Researchers also suffered tragedy this summer when a veteran member of a group that helps rescue right whales was killed by one while trying to disentangle it from fishing gear. Joe Howlett of Campobello Island died July 10. The North Atlantic right whale is the most endangered species on Earth after its cousin, the elusive, enigmatic North Pacific right. Slow, docile, full of oil and fond of the shore, they were seen by whalers as the “right” whale to hunt until the early 20th century when they became too rare to be worth targeting. Although protected from hunting for more than a century, the species remains on the verge of extinction, with all too many washing ashore after fatal encounters with ships and fishing gear. In the mid-20th century, researchers wondered if the species might already be extinct, until a few individuals were spotted around Cape Cod and Grand Manan. Since 1980, researchers at the New England Aquarium have maintained a unified catalog and database, including all photographed sightings and data on the species collected since 1935. Individual right whales can be readily identified by the pattern of callosities, white patches of thickened skin created by sea lice living there. Ninety percent of the individuals to have lived in this time period are believed to be in the database, which has been used to identify the whales now in the Gulf of St. Lawrence and will help researchers plot their movements.